Today is Saturday. This is the day the station celebrates Thanksgiving. Since I did not reserve a seating slot because I was out of town I asked what I was supposed to do. I was told to attend the 7:00 PM seating. 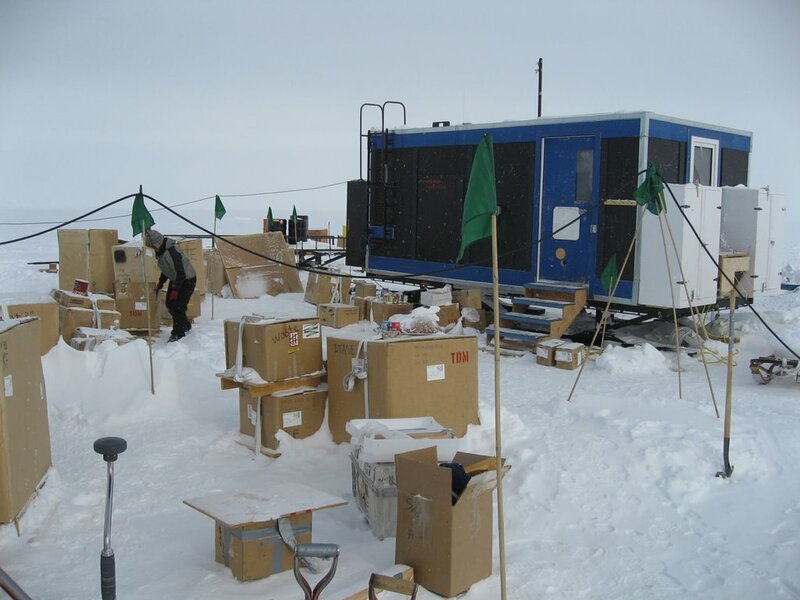 I will meet up with a co-worker at the 7:00 PM seating since he just got back into town after 10 days at WAIS (West Antarctica Ice Sheet) deep field camp. The day after he got back to McMurdo he went up on top of a new repeater site mountain called Mt. Aztec. Everything keeps moving around here, especially the Comms guys. The experience out at Taylor Dome was something worthy of deep reflection. It was more harsh than I originally expected. I am surprised a little that I didn't expect it to be as harsh as it was, but it was. The camp was not totally organized as it might have been (definition of a camp I suppose). It reminded me a little of what someone tells you what a visit to Sub-Saharian Africa is like. It always seems deeper and worse than can be adequately described. The pictures show something different than what you feel. I was exhausted from altitude, cold and exertion. 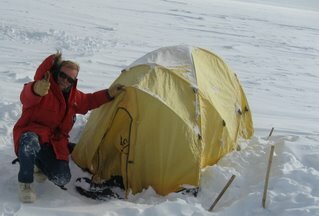 It was between -30 and -40 in that picture of me next to my tent. It was snowing and blowing (and this was a nice day) I took my hat off for the picture. Of course there were discussions of what it must have been like for the early explorers dragging their man sledges day after day after day and setting up and tearing down camp everyday. 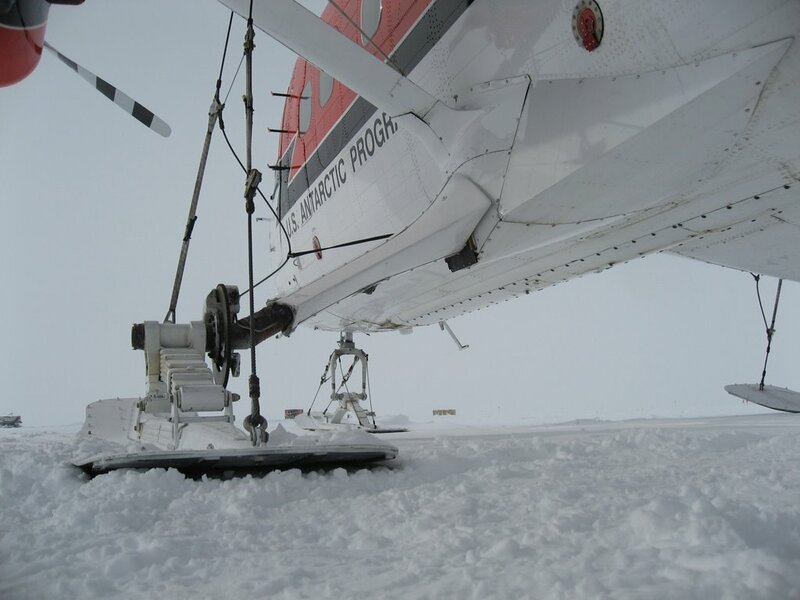 Walking on the polar plateau is very similar to the conditions on the Ross Ice Shelf. It is an interesting experience for the senses. You walk along on what feels and sounds like styrofoam. It is loud and squeaky with quite high pitched noises eminating very much like when you twist a piece of solid-dense styrofoam. When a tractor or a heavy piece of equipment comes by the vibrations are felt for perhaps 20 or 30 meters or more if it is particularly heavy. Often the surface appears quite smooth although there are small ridges of what is called "sastrugi". The waves of sastrugi are filled in with the softer fresh blowing snow that often looks identical to the the very hard older snow. Your feet get a little wobblely since your brain does not get a visual warning of the surface density. Your boots sink in 0 to 4 inches in the area where we were. The third picture down is the ITASE kitchen (not to be confused with a galley). 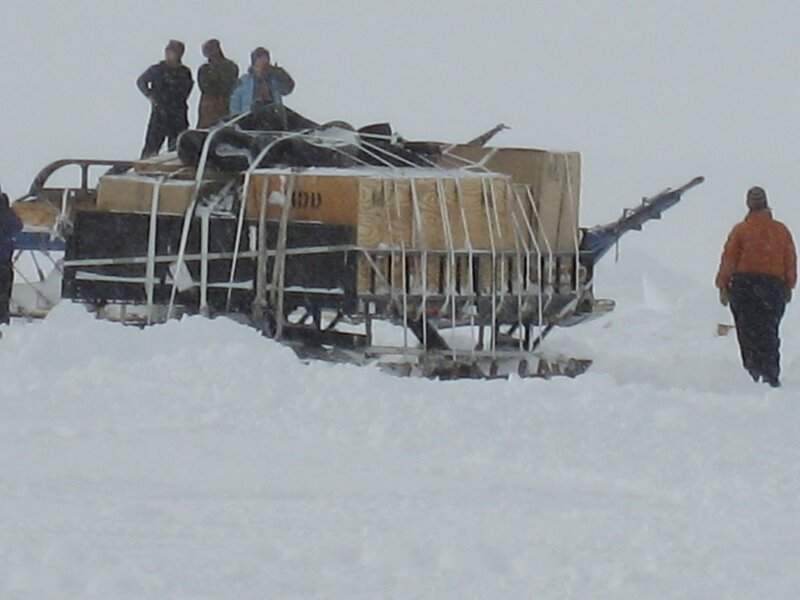 it is on skis so it can be towed along with everthing else. There were 12 of us eating in the kitchen. There are bunks, a stove, DNF (Do Not Freeze) provisions, bunks and other stuff in there. The plan for this years traverse I believe is halfway to pole. Science is conducted along the way. I got on my manpack SSB radio out at Taylor Dome. Nothing. I spent some time today at the hamshack. So far today, nothing. The radio is amazingly quite when the bands are not open. I will be back in to try and find the band open up. It does open on 20 meters but it has been fairly unpredictable. I will be on 14.243 MHz and 40 meters around 7.290 MHz. The callsign is KC4USV.